Hearts have added to their defensive options with the signing of Igor Rossi Branco on a one-year deal after the Brazilian's exit from Maritimo. The 26-year-old centre-back makes the move from Portuguese top-flight club subject to international clearance. Igor Rossi told Hearts' website: "I am a leader, I play aggressively, with passion, and I like the ball at my feet to play from the back. "From what I have seen, this is the Hearts way." Igor Rossi spent four years in Portugal after moving from Brazilian club Internacional, where he was part of the side that won the 2010 Copa Libertadores. But he only made two starts and two substitute appearances for their first team last season, while he made 10 appearances for Maritimo's second string in the Portuguese second tier. 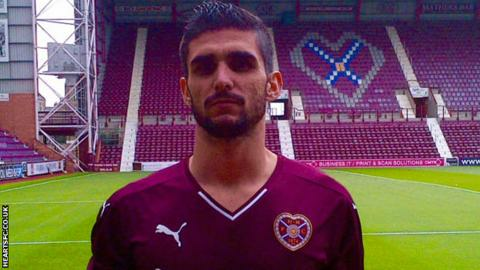 Igor Rossi revealed that Hearts' director of football, Craig Levein, was pivotal in bringing him to Robbie Neilson's side. "I had seen Scottish sides in Europe, particularly Celtic and the Scottish national side, and, when I was aware of Hearts' interest, I read up quite a bit about them and saw that they won the league by a huge margin over Rangers, so I was very impressed," he said. "Robbie was very impressive and he explained to me his ambition for the club, where he expects us to be in the future and how he wants the team to play. "Craig also spoke very well to me and I was immediately convinced that I should come to Edinburgh and play for the Hearts. "I believe I will bring good experience from my five years playing in the Portuguese Division 1 and in the Europa League. "I want to help the club challenge in every tournament we play in and I want to help my new team-mates. "I'm also hoping to score some goals as I'm good in the air."